In today’s society, dominated by fast-food culture, discovering the diversity of the ingredients and appreciating their natural smell and flavor reminds us what the real culinary arts is. All the ingredients are blessing from nature, and we appreciate each ingredient’s flavor as it is. That’s the basic of Italian cooking”, says the Italian Home Cooking professor, Ms. Gaia. In Italy, love and respect for nature are the origin of all handmade products – whether it is culinary art or plastic art. Home cooked meals are always delicious and filled with warmth. The recipes handed down from parents to children represent the taste of the family. It is something that cannot be learned in a large sterile kitchen of a school. The dishes are prepared quickly using fresh and natural ingredients, with just some seasoning measured by eyes, but their taste is so special as no restaurant could offer. Italian Home Cooking is not just about learning recipes; the spirit of sharing a good time is a crucial element of each meal. In the typical Italian home, there is always plenty of food to accommodate even unexpected guests and spend enjoyable moments together. Italian Home Cooking program represents a unique opportunity to experience such Italian spirit directly and to re-discover the real fragrance of fresh ingredients and the preciousness of the time to share and enjoy life together. Time will fly by while having fun and learning in a cozy home kitchen. 3 reasons why FCAS Italian Home Cooking is different from other cooking courses. 1. 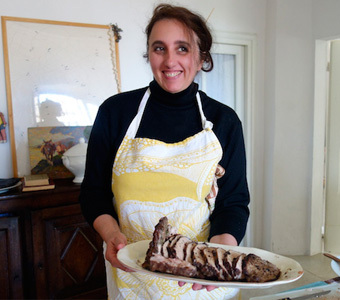 Our cooking professor is not just any Italian “mamma” teaching cooking, but our teacher is a recognized professional “cuoca”, who has published cooking books, and who also teach the secrets of the homemade Italian cuisine. Each lesson covers lots of important aspects about the Italian culture as well. 2. Lessons are held 4 days/week 3-4 hours each day. In just a month, students can learn and practice up to around 65 recipes. 3. Lessons are held in a small group of around 5~6 persons, followed by a lunch (or dinner) together. In a very friendly and relaxed environment, the participants will also visit the Central Market of Florence guided by their instructor to get familiar with the Italian fresh ingredients. 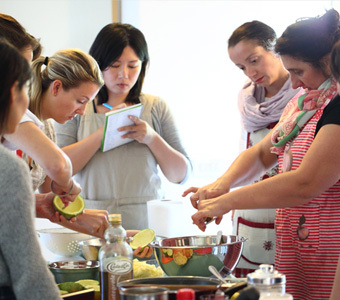 Our cooking instructors are not just any Italian “mamma”, but they have rich experience in the culinary field and in teaching international students from all over the world. They will teach not only a variety of recipes but also will help students broaden their cultural knowledge. Lessons are held in their own home kitchen, giving participants the best opportunity to learn authentic Italian homemade cooking in a comfortable and pleasant environment. The course takes place in a small group of around 6~8 participants. Since classes are taught by different instructors, the class size will not exceed 8 students per instructor.